If you read nothing else from this collection, you should grab this to read ‘Dragonfly’. The other stories fill in bits and pieces of the background, or use the world to tell a new story that is small in scope compared to Ged’s. ‘Dragonfly’, on the other hand, is necessary (to my mind) to really understanding The Other Wind, and should definitely be read first. It introduces a character who becomes important, and events which are referred to throughout the novel. 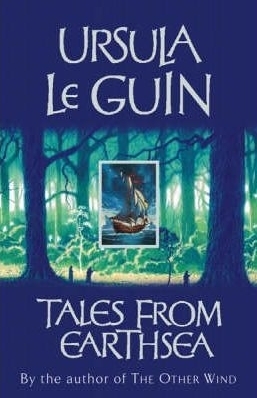 As for the writing of the stories themselves, well: Ursula Le Guin’s prose is as fine as you would expect, and the words are precise and crisp and each placed exactly right. The glimpses of history and other places which we get in these stories is worth the price of entry, too. I think ‘Darkrose and Diamond’, for instance, is incredibly slight compared to Ged’s story, but on the other hand it does reflect on some of the same themes as Tehanu. As does ‘Dragonfly’, in different ways. I loved her Earthsea books. I will have to make a note to pick this up.